Devon, Pa. - Oct. 5, 2018 - The Canadian-based team of Leatherdale Farms, Diane Creech and her daughter Vanessa Creech-Terauds, had a standout week winning five CDI classes with three of Leatherdale Farms' upper-level Hanoverians at the prestigious Dressage at Devon in Pennsylvania. On Friday, Sept. 28, Creech headed down centerline with Hallmark (His Highness-SPS Lapislazuly, Lancier), a 14-year-old Hanoverian gelding, in the big tour. In their CDI3* Grand Prix class, the pair placed second and improved the next day to win the CDI3* Grand Prix Special with a 65.936 percent. "I was very proud of Hallmark as it was his first time showing under the lights," Creech explained. "He also had not been in a show ring since competing at the Adequan Global Dressage Festival in Florida. During our first ride, he was a little unsure and stayed behind my leg, but the second test was so much better as he gained more confidence." Riding another His Highness progeny, Creech-Terauds swept both of the CDI Young Rider classes aboard Harley L (His Highness-MS Eileen, Espri), a 12-year-old Hanoverian gelding. The pair are a relatively new partnership, but have experienced great success together thus far, representing Ontario well at the Adequan/FEI North American Youth Championships over the summer. Harley L won both of his classes with a score of 68.775 percent in the Young Rider Team test and a 68.971 percent in the Young Rider Individual test. 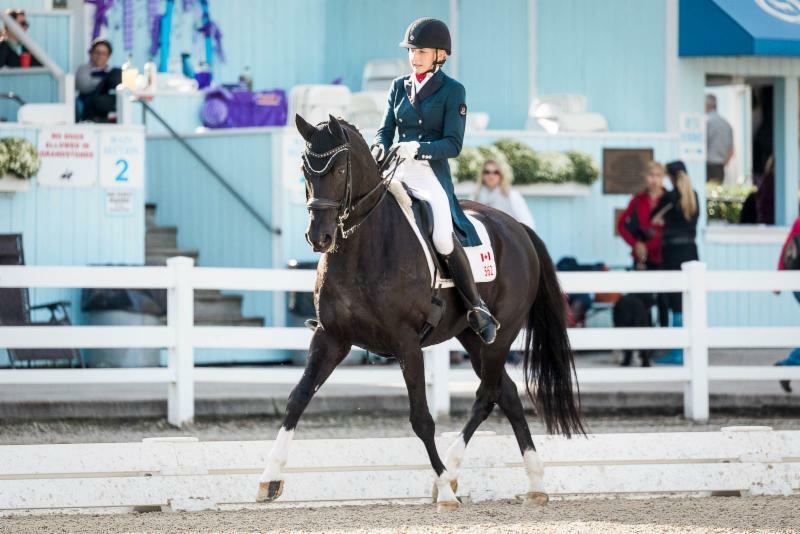 "I am so excited with how well Harley L performed at Dressage at Devon!" Creech-Terauds said. "He gave me two very beautiful and fluent tests, and handled the pressure of the big Dixon Oval like a champ. Being his first year competing at the FEI Young Rider level, I am extremely proud of the progress we have made as a team together and am looking forward to the upcoming Florida season." "The performances by both Hallmark and Harley L over the weekend demonstrates the high performance quality and great temperament His Highness passes on to his offsprings," Creech explained. "I have spoken to many owners of his progeny and while they may buy them with the intention to sell, after a short time, they decide they can't let go and end up keeping them for life. Like having jewels, you do not want to let go because they are so very special." Continuing the success for Leatherdale Farms, Creech-Terauds also rode the 18-year-old Hanoverian gelding Devon L (De Niro-EM Wibranda, Wolkenstein II) in the CDI U25 Grand Prix division. Both of her mounts, Harley L and Devon L, were born at Leatherdale Farms in Long Lake, Minnesota. While the talented chestnut has many CDI Grand Prix wins with her mother, Creech-Terauds used the opportunity to gain Grand Prix experience under Devon L's tutelage. While competing in the Dixon Oval, the duo topped the leaderboard in both of their CDI classes with a 66.647 percent in their Intermediate II and a 65.128 percent in the U25 Grand Prix. "Devon L once again showed us that age is only a number and he is still a force to be reckoned with," Creech-Terauds said. "He went into the ring confidently and enthusiastically and we were able to ride two really nice tests. I always enjoy riding and learning from such an experienced horse like him, as well as enjoy spending time with his bold and loving personality."